Perhaps you have recently discovered that better breathing can improve your health, and that respiratory muscle training can increase your athletic ability. Or, you have been advised that a respiratory muscle training device can increase your respiratory capabilities while suffering from asthma, Parkinson's, COPD, or the cycle of inactivity, all which lead to breathlessness. After searching through the variety of devices available on the market, you have chosen PowerLung. This respiratory muscle training device expands your respiratory capability (and your health), so you want to utilize it effectively. PowerLung wants you to find success with your device, and have designed training programs to help you maximize your use through the stages you will experience while increasing respiratory muscle strength with the PowerLung. As with any type of exercise program, it is important to allow your body to ease into more strenuous exercises with a warmup. Just as you cannot expect your legs to be immediately ready to run 5 miles as soon as you put on your running shoes, your respiratory system needs time to prepare for more intensive work. 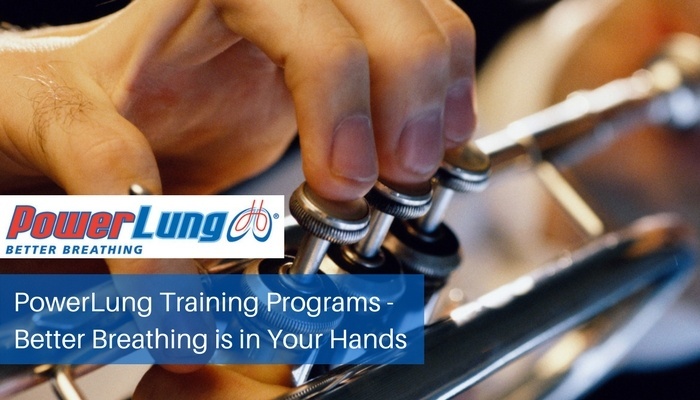 Using PowerLung as a part of any pre- training routine, practice, competition or performance assures your breathing muscles are ready to assist you in your activity. Deep breathing with the PowerLung allows your lungs to stretch and your respiratory muscles to warm up, extending blood flow throughout the body. By doing this for 5-10 minutes, you inhaled more oxygen-rich air, exhaling the carbon dioxide and oxygenating your blood. Your brain releases chemicals to calm yourself, and you can begin to concentrate on the next few steps in your regimen. Take this time to do some visualization exercises as well, imagining success at your next challenge. This is especially helpful when rising to the next level in your athletic program, or undertaking a new routine. You can reduce the settings on your PowerLung and perform 3 sets of 10 breaths or maintain your current settings and perform 10 to 15 breaths on your PowerLung. The cooldown is a little more automatic, as your body and lungs naturally slow down when the intensive training session is over. However, this is where you can really make a difference in improving your breathing technique. Make a sincere effort to breathe deeply—maximizing your diaphragm’s use and slow down your respirations. Now that you have prepared your respiratory system for a more challenging workout, spend just a few minutes to “train” your lungs as part of that routine. This simple 10-minute program is easy to include, and can be tackled no matter your location. In fact, you can warm up on the treadmill, stretch, or even use the stationary bike while completing your PowerLung respiratory training routine! The following program is the foundation for any new or returning PowerLung user. It is designed to train deep breathing and strengthen and train the respiratory muscles. A repetition begins when you breathe in and completely fill your lungs, and ends when you breathe out, completely emptying your lungs. A complete set consists of a total of 10 repetitions. You can split this between mornings, afternoons, evenings or any routine that works best for you. Be sure to do it at least 2 times a day for best results. Breathe in through your PowerLung for 3 seconds. Fill your lungs as completely as possible in this time. Listen for a smooth, full sound of air passing through your PowerLung. Pause for 2 seconds to allow your muscles to adjust for exhale use. Breathe out through your PowerLung for 3 seconds. Completely empty your lungs at the end. Listen again for the smooth, full sound of air passing through the device. To avoid "puffing" your cheeks use your lower abdominal muscles to help. Repeat these steps two more times for a total of 30 repetitions, which can be split into two sessions each day. Each use period takes only 5 minutes! For those whose activities require holding breath for an extended period of time, like divers, swimmers and brass musicians, this routine can improve the length of time you can hold your breath. Set your PowerLung at your regular training settings and place the PowerLung in your mouth. Inhale through your PowerLung, hold your breath until you absolutely feel you can no longer hold it. Exhale through your PowerLung hold your breath until you absolutely feel you can no longer hold it. Repeat Steps 1 and 2 for a total of 3 breaths. For athletes who have been using the PowerLung warm-up and training programs for at least 4-6 weeks, adding a short routine between laps is another way to increase respiratory capabilities. Start with 10 breaths between each lap, gradually increasing the procedure to a point where a complete training rotation between laps can be completed without breathlessness. You may start at a lower level and increase the resistance over time. When you feel as though you are no longer challenged by your PowerLung training program at the current settings, note that you can change the control dial to increase your training threshold. There are separate settings for both inhalation and exhalation, so you can customize your threshold to your individual level. Once you have made several adjustments and maximized the use of your device, it may be time to increase the resistance beyond the device’s current capabilities. Although PowerLung has created models for various needs, you are not held at that one level. PowerLung wants you to celebrate your achievements and keep challenging yourself and your respiratory system. Therefore, you can purchase higher resistance cells to put in your current device when you are ready to rise to the next level! On the other hand, after an extended period without training with the PowerLung, you may need to step down to a lighter threshold. Therefore, having several sets of resistance cells provides you with a product to fit your individual training needs, and helps account for illness or injury when you need a lighter challenge. Remember, it only takes about 10 minutes each day to give your respiratory system a strong workout. Consistency is key, like any other athletic routine, and the PowerLung training routines can be added easily into your existing routine. Th convenient carrying case and cleaning solution allows you to take your PowerLung with you wherever you go, so you never have to disrupt your routine for travel. Our experts are available to answer your device or training questions, providing you with the confidence at every stage of your respiratory muscle training journey! Visit PowerLung for additional information and follow the Better Breathing Blog for regular tips and stories!